WHY AND HOW TO OPPOSE FRACKING RIGHT NOW | Subject. Object. Fracking is real, fracking is frightening, fracking isn’t much in the news, but fracking could soon be taking place across Britain – within a few months. The only political parties opposing it are the Green Party, Welsh and Scottish Nationalists (and perhaps surprisingly, Northern Ireland loyalist and republican parties) Surely we the people have to do something when most of our politicians are acting as one? Here’s my attempt to galvanise the masses. AN IRRESISTIBLE PREAMBLE: The real bane of my chequered career as a journalist has been a struggle to keep things brief. I have regularly had people pulling their hair out because I feel things need to be explained properly rather than just skimming the surface, and I have metaphorically pulled my own hair out when told I have to keep to a certain word count, and spend more time trying to judiciously cut my own copy than researching and writing. Earlier blogs on here referring to the Infrastructure Bill I decided to provide chapter and verse, in the vain hope journalists might be able to sift through the research data and the links to find their own angles. (In the event, to my knowledge, none did – I just had flak from would-be campaigners about its lack of assessibility). And yet, though it wasn’t reported in the national media, our campaign group Hands Off Our Forest managed to muster enough support to force the Government into a U-turn on November 5, 2014 and exempt public forests from land transfer schemes (to the private sector) within the Infrastructure Bill. HOOF’s work in achieving its main objective – lasting protection for forests against privatisation – goes on, but we managed to avert that particular danger (for now, at least). However, while HOOF might be victorious, the Infrastructure Bill – which is now weeks away from becoming law – still allows for any other public land to be grabbed by privateers; for our roads to be privatised; for various owls, hawks and boar to be mass exterminated if they are not deemed ‘native’; for massive short cuts in planning for developers; for the Land Registry to determine land ownership disputes; for decision-making on ‘nationally significant’ projects such as energy to be placed in the hands of one Government minister; and for fracking to take place anywhere and everywhere, including under people’s land without their permission, and for ANY SUBSTANCE to be dumped underground – this would not only enable toxic chemicals from fracking, but also nuclear waste to be dumped anywhere the industry sees fit. It does cause me some concern that the prospect of developers having carte blanche to raid our precious little public land when most of the country’s vast private estates are left untouched, and that roads and railways, airports and nuclear power stations may be built with the communities it afflicts not given a say has raised barely a ripple of concern among the populus (many, I guess, are still unaware this will happen – thanks for keeping everyone in the dark, all you successful journalists). While all that is being ignored, at least many environmentally-minded people are awake to the fracking elements of the Bill. But, really, where is the media coverage? How many people generally are aware of what fracking even is? How many people believe politicians’ claims that environmentalists are just scaremongering about earthquakes, water pollution, and instead we should be looking at an ‘indigenous’ gas bonanza which will bring our energy bills down and create jobs? Lord Wigley was comprehensively defeated in the Lords after this speech: Labour’s attitude is to regulate fracking rather than oppose it. Is the banning of fracking by France and the US state of Vermont, and the suspension of it (a moratorium) by Germany and the Netherlands not worthy of consideration? HOW WILL FRACKING AFFECT YOU/US? Fracking involves drilling deep into bedrock and fracturing it to release gas locked tightly within compacted shales. A very quick geology lesson: beneath our soil, subsoil and clays there is rock 40km deep. Much of that rock has been created by volcanoes or magma from below the rock/ crust. But about 4km of it closest to the surface was created from sediment during the past 500 million years. It’s the limestone that generally contains shale gas, as limestone was created from compacted organic matter (in particular, the skeletons of prehistoric sea creatures). It all depends how deep the limestone goes whether it is suitable for fracking. 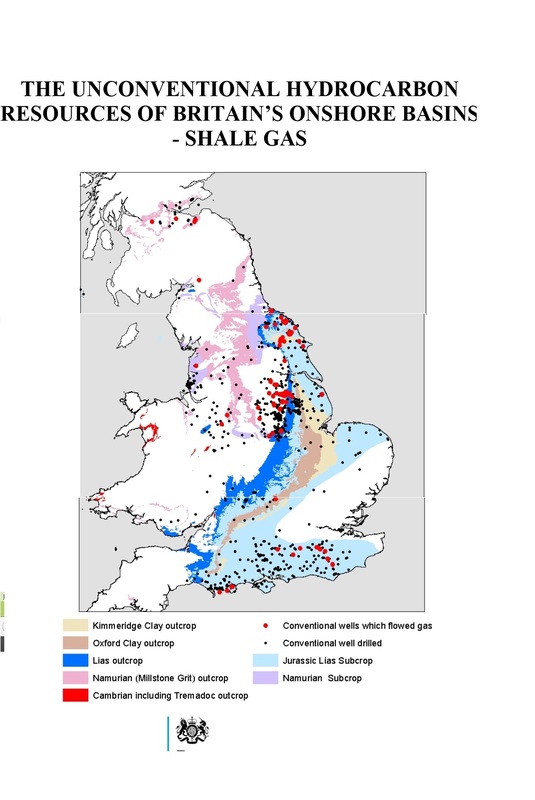 All the coloured areas on this map are the frack-friendly rocks (according to the British Geological Society which is helping the Department of Energy and Climate Change). In my area, the Forest of Dean, for example, the closest areas suitable for fracking are the blue lias outcrops immediately east of Westbury-on-Severn and the Cotswolds, and near Newport, as well as the carboniferous edges of the South Wales coalfield (licences are already in place for fracking exploration in South Wales). The document this map was taken from actually warns of the dangers of fracking in the ‘Variscan belt’ area, a major fault zone which stretches from the Gower to the Mendips just south of Bristol and across to London. In my area, May Hill, the Malverns and a step underneath the Severn which creates the famous Severn Bore tidal upstream wave, is the major fault line which separates the Worcester Graben or Basin (that streak of dark blue on the map) from the Forest of Dean and South Wales. Would the Forest of Dean coalfield instead be suitable for coal gasification? This involves setting fire to coal seams to extract the gas from a power station above. Not much is being said about this at this time, but it’s a scenario to watch out for in the future. But even if we are far away from a drilling zone, our watercourses are connected – we are a fairly small landmass/island – and many of our hills and raised areas, as well as basins, were created from earth movements along established fault lines. Geologists, who sometimes double as the energy industry, say there is not much to worry about seismically. Even so, the widespread potential pollution of our water supplies, particularly if any substance can be left underground, has to be a cause of concern? Page 45, line 12, leave out Clauses 38 to 43. The Bill is due to end its current stage, Committee, in the House of Commons, then move on to Report Stage, and then to the Third Reading and finally be given Royal Assent and become law. The Committee stage is due to end on January 15 (possibly before). It is likely that the Report Stage will offer MPs the chance to vote on the Sussex MPs’ motion to scrap fracking from the Bill. BUT WHAT’S THE ALTERNATIVE TO FRACKING? We need energy, so what’s the alternative? It certainly isn’t nuclear, for starters. If countries such as Denmark and Germany can get more than 90 per cent of their electricity from renewable energy, what is stopping the UK from doing so? Partly opposition to wind and solar installations and a reluctance to invest in hydro power… but also because they don’t offer a commodity as in oil or gas, they are not in the interests of capitalism. Ultimately, you might say, the green revolution may be impossible without a social revolution which ends capitalism. In the meantime, we only need to point to Continental Europe to demonstrate the viability of clean, renewable energy, and also the rest of Northwest Europe’s opposition to fracking as being fundamentally dangerous.